A Indica-dominant hybrid with a dark green colored bud that%u2019s semi dense. A unique lemon smelling bud with a strong body high, great for stimulating the mind. 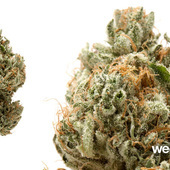 A tasty OG that lingers well after you take a big hit. It looks scrumptious and smells like a bed of flowers. Packs a huge punch, take one hit and you're good for a while. Gives you that warm fuzzy body high with slight face tingles.